This is a great craft for days that kids are stuck inside or if your child does not like to take a bath. Shaving Cream Bath Tub paint brings fun to bath time. this is a super easy recipe and can be made very quick. 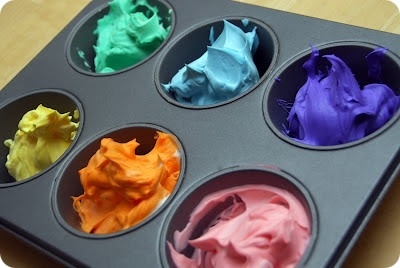 All you have to do is mix shaving cream (I bought the generic brand) and any color of food coloring you would like. This makes a foamy paint that will not permanently die the skin. So next time you need to make bath time more fun, whip up some Shaving Cream Bath Tub Paint.